What if the person who invented chess forgot something wondered Martin Maheux, owner of Laurier Lounge and former chef? This idea so captivated Maheux that he began to devise a change (or amelioration) to the venerable game of chess - adding a flagbearer and dragon (two additions which came to him in a dream). At the international launch of his game, Crusade and Conquer, guests dined on Laurier Lounge fare, sipped wine and played the competitive, exciting game while a video featuring Maheux played on huge HDTVs throughout the historic home. Martin Maheux chef turned inventor extraordinare. Don Dragon , the game's mascot squares off with a fellow player. 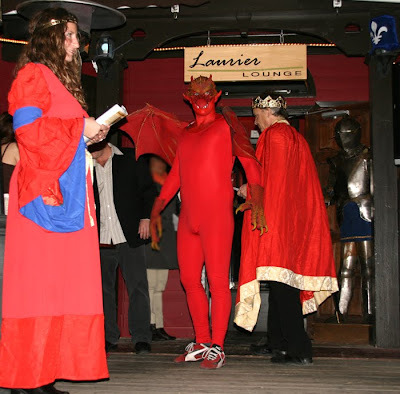 Laurier lounge hosted the event, which included life-size costumed playing pieces. The two new additonal pieces to the game - a dragon and a flagbearer. The entire board game - a closer look at Crusade and Conquer. Guests enjoyed salmon bruschetta, cucumber and tomato slices and shrimp and pate on baguette. Skewered meats alongside fried broccoli. A server happily brings out a platter for guests.